Msfvenom Payload Creator (MPC) is a wrapper to generate multiple types of payloads, based on users choice. The idea is to be as simple as possible (only requiring one input) to produce their payload. Fully automating msfvenom & Metasploit is the end goal (well as to be be able to automate MPC itself). The rest is to make the user's life as easy as possible (e.g. IP selection menu, msfconsole resource file/commands, batch payload production and able to enter any argument in any order (in various formats/patterns)). Don't know what your external IP is? MPC will discover it: wan. Want to mass create payloads? Everything? Or to filter your select? ..Either way, its not a problem. Try: batch (for everything), batch msf (for every Meterpreter option), batch staged (for every staged payload), or batch cmd stageless (for every stageless command prompt)! Note: This will not try to bypass any anti-virus solutions. Designed for Kali Linux v1.1.0a+ & Metasploit v4.11+ (nothing else has been tested). [i]   Example: /usr/bin/mpc windows 192.168.1.10        # Windows & manual IP. [i]            /usr/bin/mpc elf eth0 4444               # Linux, eth0's IP & manual port. [i]            /usr/bin/mpc stageless cmd py verbose    # Python, stageless command prompt. [i]            /usr/bin/mpc loop eth1                   # A payload for every type, using eth1's IP. [i]            /usr/bin/mpc msf batch wan               # All possible Meterpreter payloads, using WAN IP. [i]            /usr/bin/mpc help verbose                # This help screen, with even more information. [i] Rather than putting <DOMAIN/IP>, you can do a interface and MPC will detect that IP address. [i] Missing <DOMAIN/IP> will default to the IP menu. [i] Missing <PORT> will default to 443. [i] <CMD> is a standard/native command prompt/terminal to interactive with. 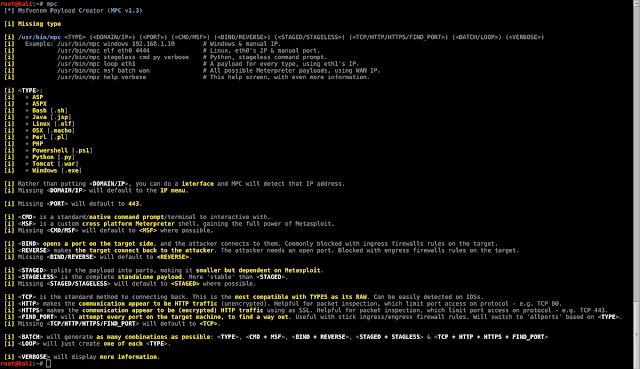 [i] <MSF> is a custom cross platform Meterpreter shell, gaining the full power of Metasploit. [i] Missing <CMD/MSF> will default to <MSF> where possible. [i]   Note: Metasploit doesn't (yet!) support <CMD/MSF> for every <TYPE> format. [i] <CMD> payloads are generally smaller than <MSF> and easier to bypass EMET. Limit Metasploit post modules/scripts support. [i] <MSF> payloads are generally much larger than <CMD>, as it comes with more features. [i] <BIND> opens a port on the target side, and the attacker connects to them. Commonly blocked with ingress firewalls rules on the target. [i] <REVERSE> makes the target connect back to the attacker. The attacker needs an open port. Blocked with engress firewalls rules on the target. [i] Missing <BIND/REVERSE> will default to <REVERSE>. [i] <BIND> allows for the attacker to connect whenever they wish. <REVERSE> needs to the target to be repeatedly connecting back to permanent maintain access. [i] <STAGED> splits the payload into parts, making it smaller but dependent on Metasploit. [i] <STAGELESS> is the complete standalone payload. More 'stable' than <STAGED>. [i] Missing <STAGED/STAGELESS> will default to <STAGED> where possible. [i]   Note: Metasploit doesn't (yet!) support <STAGED/STAGELESS> for every <TYPE> format. [i] <STAGED> are 'better' in low-bandwidth/high-latency environments. [i] <STAGELESS> are seen as 'stealthier' when bypassing Anti-Virus protections. <STAGED> may work 'better' with IDS/IPS. [i] <TCP> is the standard method to connecting back. This is the most compatible with TYPES as its RAW. Can be easily detected on IDSs. [i] <HTTP> makes the communication appear to be HTTP traffic (unencrypted). Helpful for packet inspection, which limit port access on protocol - e.g. TCP 80. [i] <HTTPS> makes the communication appear to be (encrypted) HTTP traffic using as SSL. Helpful for packet inspection, which limit port access on protocol - e.g. TCP 443. [i] <FIND_PORT> will attempt every port on the target machine, to find a way out. Useful with stick ingress/engress firewall rules. Will switch to 'allports' based on <TYPE>. [i] Missing <TCP/HTTP/HTTPS/FIND_PORT> will default to <TCP>. [i] By altering the traffic, such as <HTTP> and even more <HTTPS>, it will slow down the communication & increase the payload size. [i] <LOOP> will just create one of each <TYPE>. [i] <VERBOSE> will display more information.